So every Monday, everyone at Creativeland gets together for a meeting. One person is made to talk about things that are close to them and everyone else contributes. And we obviously discuss other things – parties, announcements, notices etc. So this week, Nivedita spoke about Tangrams (yes that Chinese shape puzzle that everyone has played as a kid) and did an impromptu competition. Vikram, (expected ain’t it?) won all rounds. Saurabh finished a distant second. Dhvani, Urmi and Rruta were close too. Here are few things that people made. 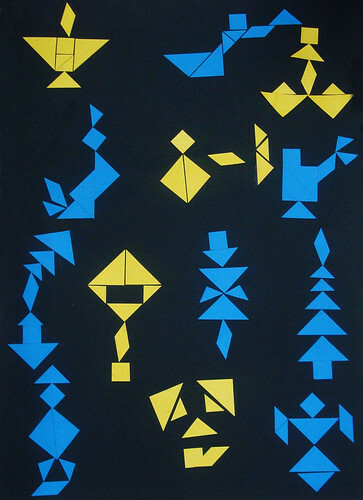 BTW, more about tangrams is here (wikipedia link). 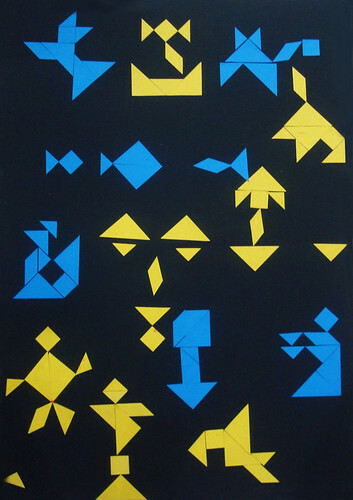 And a Google image search revealed few more interesting uses of tangrams (fonts, stick figures et al). Do share if you come across some interesting ones. Today, June 1, we celebrate our second birthday. Stay tuned for pics, quotes and vids. Apart from this one, other pics have mysteriously disappeared. Wonder who gobbled them .. ?